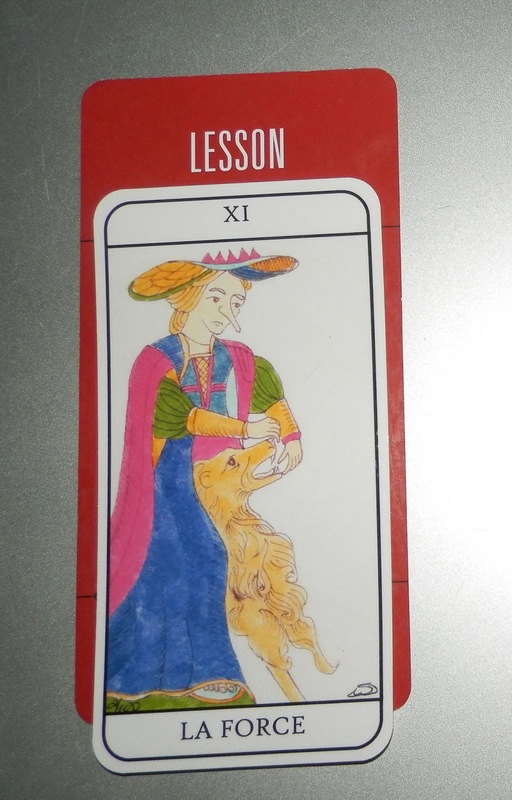 Today's Draw: La Force (Strength) from Tarot de Marseilles de Seilonen in the Lesson position from the Deck of 1000 Spreads. Are you more a creature of impulse than will? What's stronger—your animal instinct, human instinct or spiritual instinct? What do you think you've come to earth to accomplish, if anything? 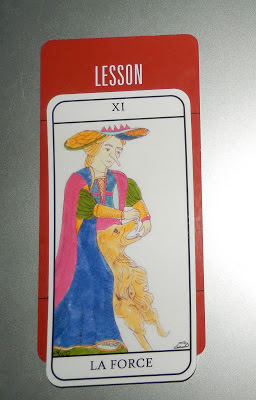 The Strength card is about exerting will over impulse or even instinct—taming the lion within, if you will. It's a profound concept, because it's integral to what most spiritual seekers try to do. We try to shape ourselves progressively further toward our spirit selves by taming our human or animal selves. As a spiritual seeker, I struggle with that notion somewhat. While I pursue a path of coming more in alignment with that part of me that is God, I also feel there's a reason why we were put down here to be human. Go too far toward godliness and you lose that part of that IS human, that IS animal and that was expected of you when you plunked yourself down here in the first place. On one hand, I believe we're here to heal/earn/learn parts of our souls, so that's an argument for spiritual growth. But on the other hand, I think there's a lot of virtue in just comfortably bringing those two "halves" of who and what we are together for a dance on earth. See, I believe our souls are eternal. And Tierney is temporary. So this body/personality of mine only gets one chance to be a human, whereas my soul gets multiple chances. So I struggle with this. How much time does one devote to rising above our mortal dregs and how much does one devote to wallowing in them? Another part of this equation is that humans are pretty incredible animals. I believe all of us were created with a two-way communications device between the human plane and the spirit one. I believe pretty much everything on earth was created this way, in fact. So, to me, there's a very definite connection between this incarnation and the eternal incarnation. And, while I talk about taming that animal part of us, I think that two-way radio is part of the animal. So it's all a very difficult thing to sort out. Regardless, this ability we have to exert will over impulse is key to our spiritual growth. Because so many of the things we discuss here at the Daily Draw—overcoming ego, forgiveness, rising above gossip, unconditional kindness—all those things rely on us breaking "habits"...exerting will over impulse. In fact any change in life—understanding those who are different than us or creating world peace, for example—relies on re-conditioning our responses to stimuli...or breaking habit. Many of the things idealists like myself want to heal on this planet are entirely about choosing a different response. Thirsty? Turn on the tap instead of breaking open a plastic bottle of water. Angry? Calm down and collect yourself instead of turning to violence or hateful words. Sad? Do something to lift others up instead of allowing yourself to sink further down. Change the response to the stimuli, change the world. That's the lesson Strength can teach us. This deck is a limited edition TdM faithfully reproduced in Seilonen style by Beth Seilonen and, like all her decks, I recommend it. There's still time to get one at www.catseyeart.com.